Road Condition: Long, bumpy dirt road. 2WD accessible. Parking: Average sized lot that was half full. May be full on busy days during peak season. Snow: Slight dusting over everything. 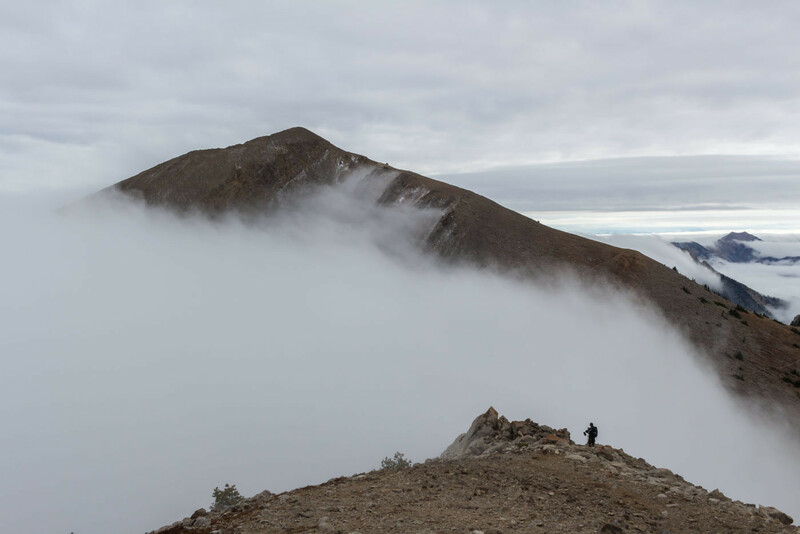 Weather: Overcast and fog up to Sacajawea Pass. 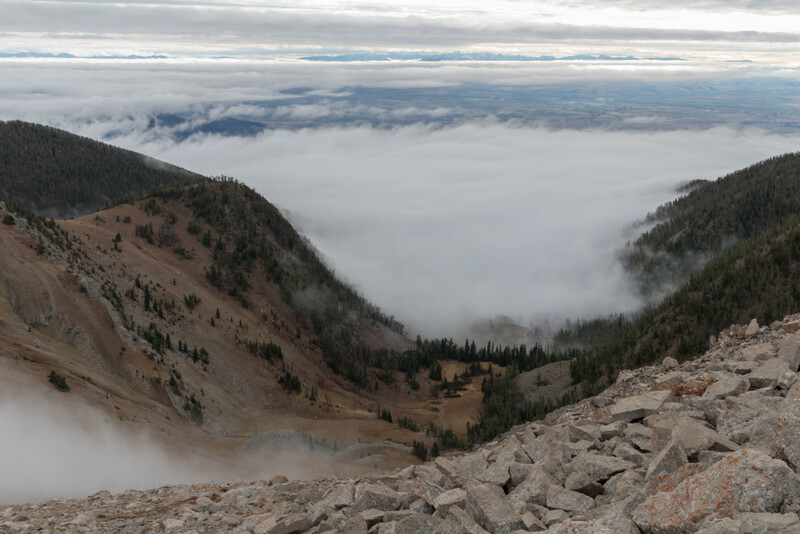 Fog cleared above this level but clouds still hung over the valley. 40-50 degrees. Windy at times. Side Quests: Pomp Peak. 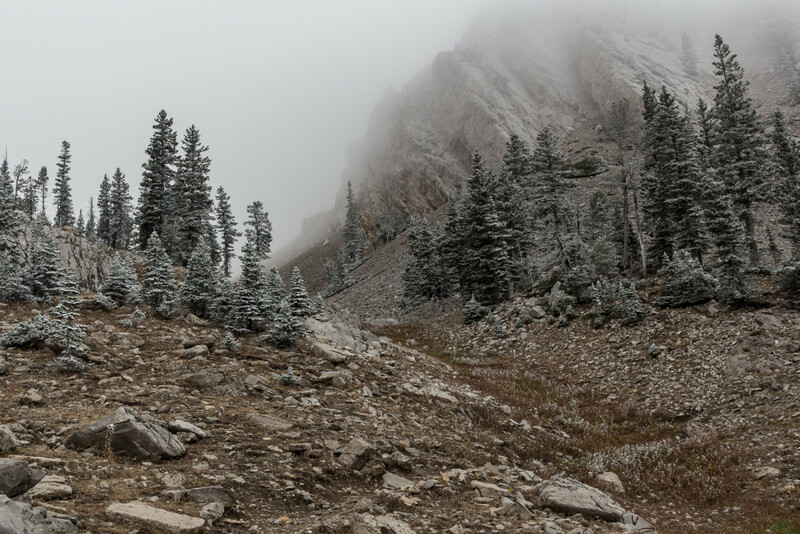 Sacajawea Peak. 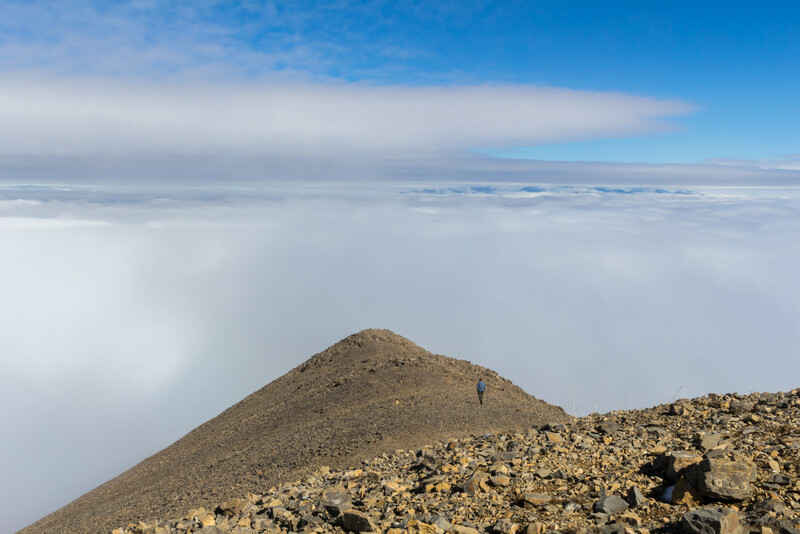 Naya Nuki Peak. 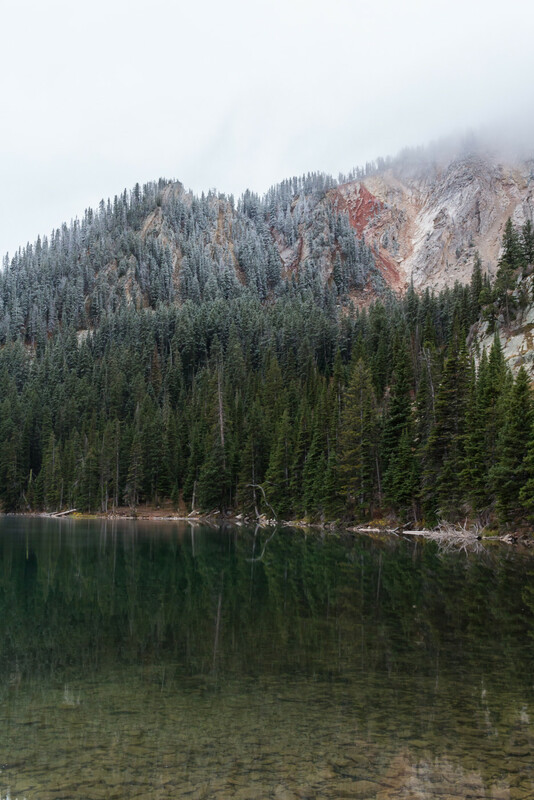 Fairy Lake loop. Hardscrabble Peak is the second highest peak along the Bridger Ridge and is located just north of the infamous Sacajawea Peak. It’s accessible from several angles but the simplest approach is from Fairy Lake. Simply follow the Sacajawea trail up to the pass and head north rather than south. It’s similar in difficulty to Sacajawea but often overlooked by newer hikers so there’s a good chance the final stretch will be traffic-free. 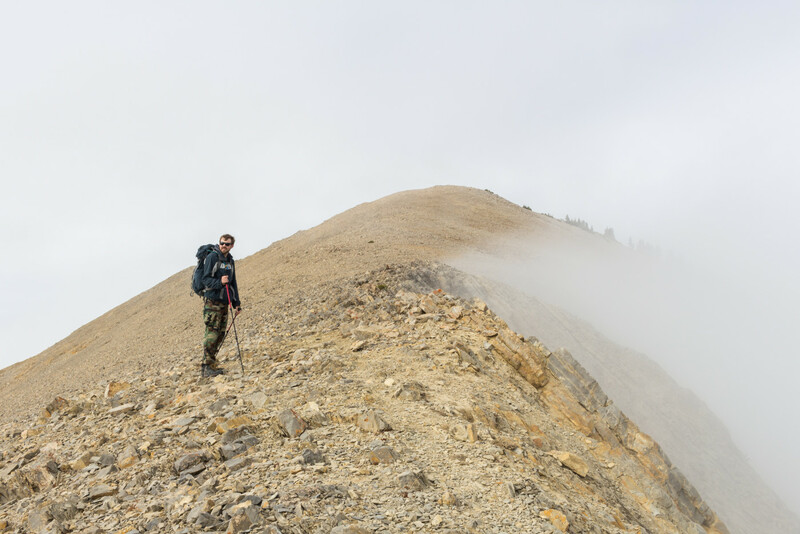 A 9500′ unnamed peak, referred to as Pomp Peak by some and often mistaken for Hardscrabble, can be bagged along the way without too much additional effort which I highly recommend. 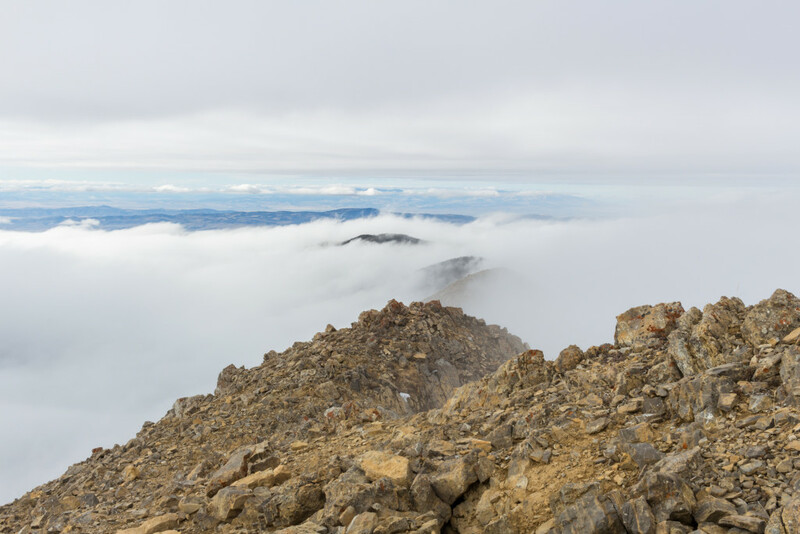 Many mountain ranges are visible from the summit of Hardscrabble and you could probably go further north along the ridge if you were daring enough. In general, I feel this hike is far superior to Sacajawea offering greater thrills, better views, and less traffic. 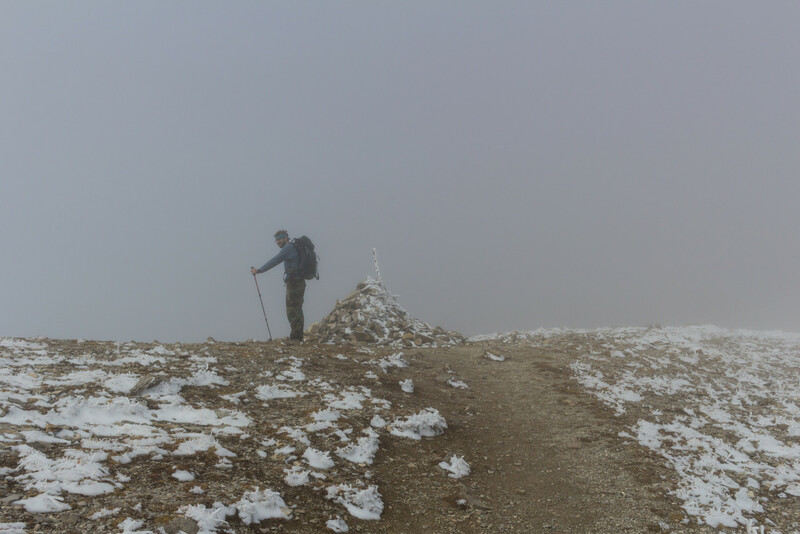 With winter approaching and snow already present at high elevations the list of potential hiking destinations was shrinking fast. 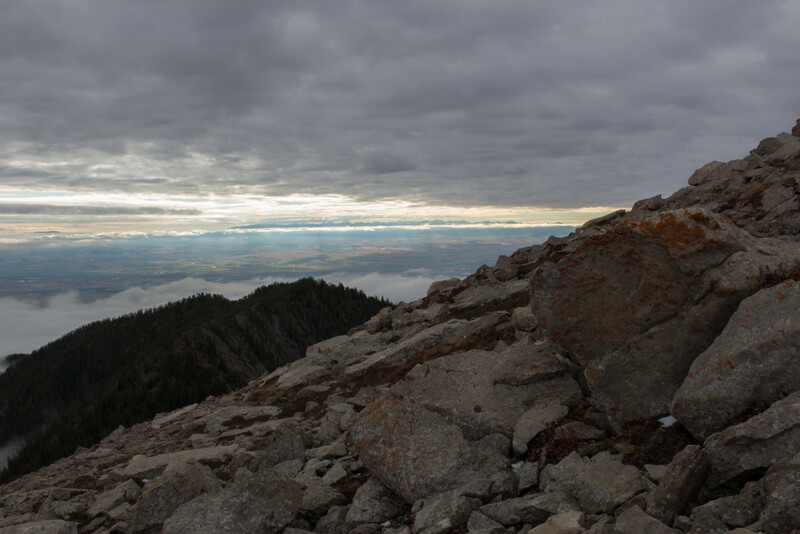 But the Bridgers were still easily accessible so we decided to stay on our home turf and attempt Hardscrabble Peak which had been on the backburner for some time now. 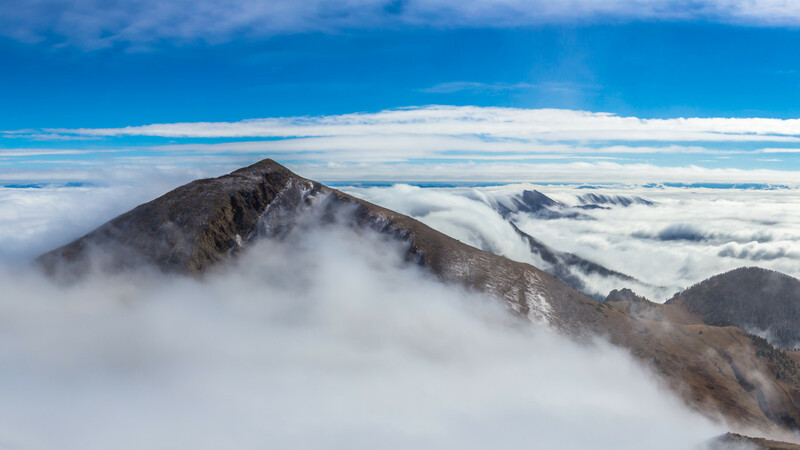 Hardscrabble Peak is the second highest peak in the Bridger Range just north of Sacajawea. 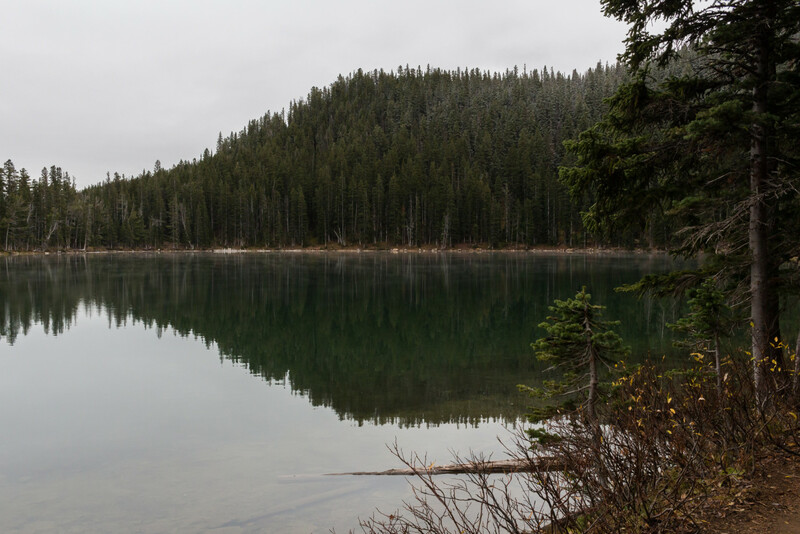 It can be accessed by several trails but the shortest is from Fairy Lake. There are no signs for Hardscrabble Peak at the Fairy Lake parking lot so unless you’re familiar with it you’d have no idea it was even there. 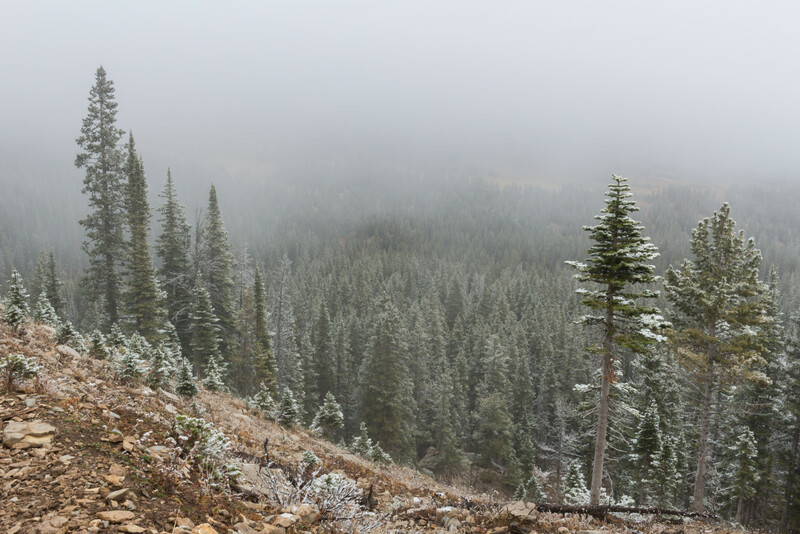 Both Hardscrabble and Sacajawea share the same trail up to Sacajawea Pass, about 1.8 miles in, at which point an unofficial trail leads north towards Hardscrabble. The adventure began on a dark, chilly October morning. 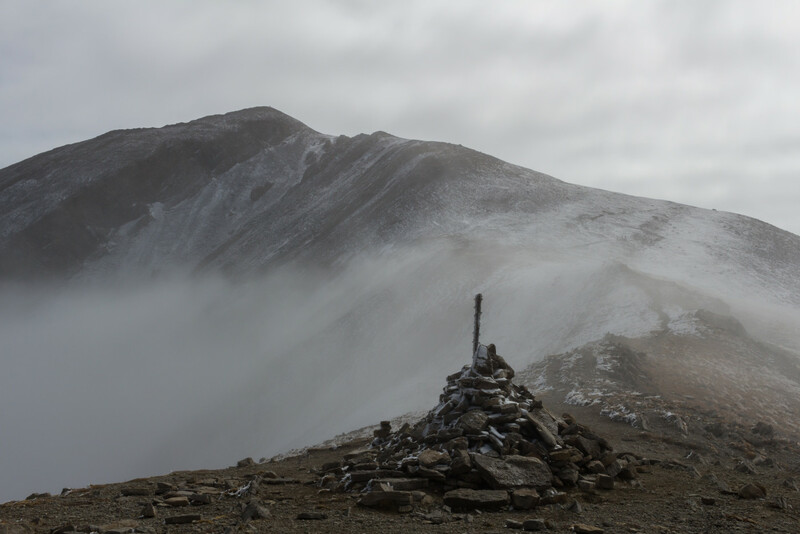 A slight dusting of snow had been sprinkled over the lands the previous night and the Bridgers were masked by low-hanging clouds. Making our way through Bridger Canyon we discussed the potential outcomes for the day. 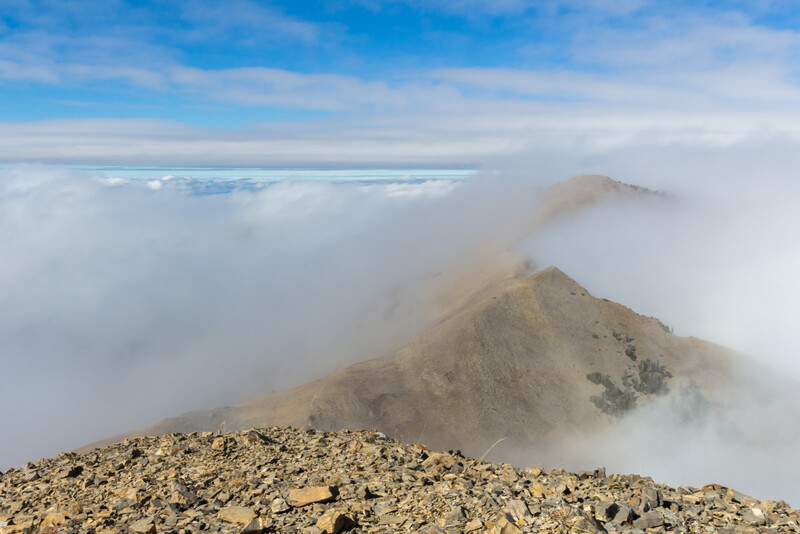 If there was an inversion layer at the right elevation we could, in theory, make it above the clouds which was something I had yet to experience in the mountains. The road to Fairy Lake was tedious as ever. 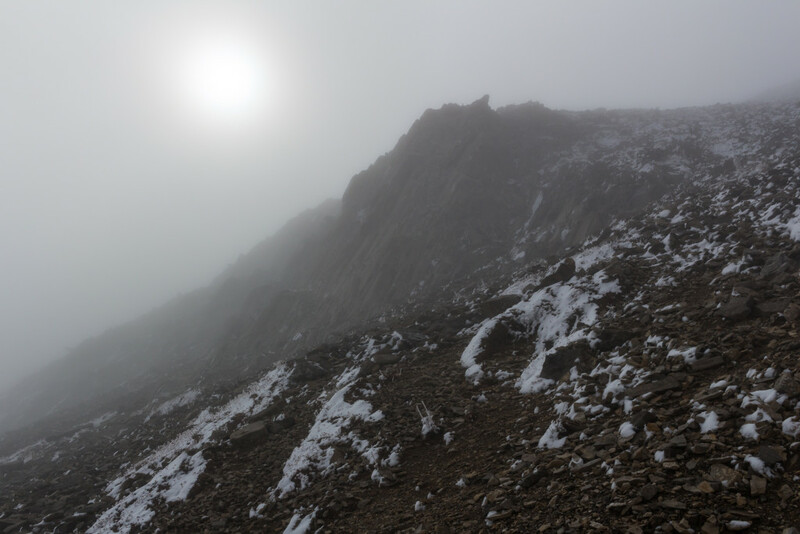 The sun refused to show its face and the visibility only got worse the closer we got but a “bad” day in the mountains is better than a good day anywhere else so spirits remained high. 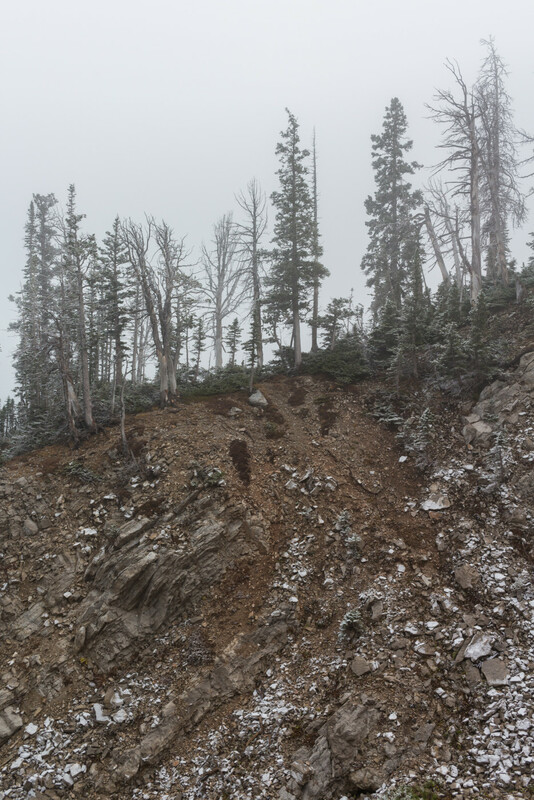 The scenery on the way to Sacajawea Pass was unlike anything I’d seen before. The weather conditions had transformed the land into something out of this world. 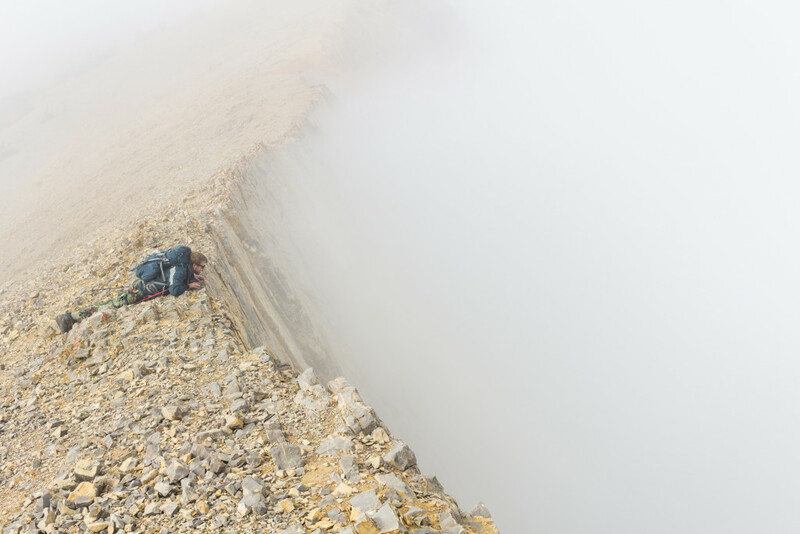 The air was so still you could hear a pin drop, the ground was barren yet beautiful, and ghastly mists permeated everything distorting reality. It was a grotesque beauty that I may never have the opportunity to see again. Our journey through the mist begins. Another shot of the mist. 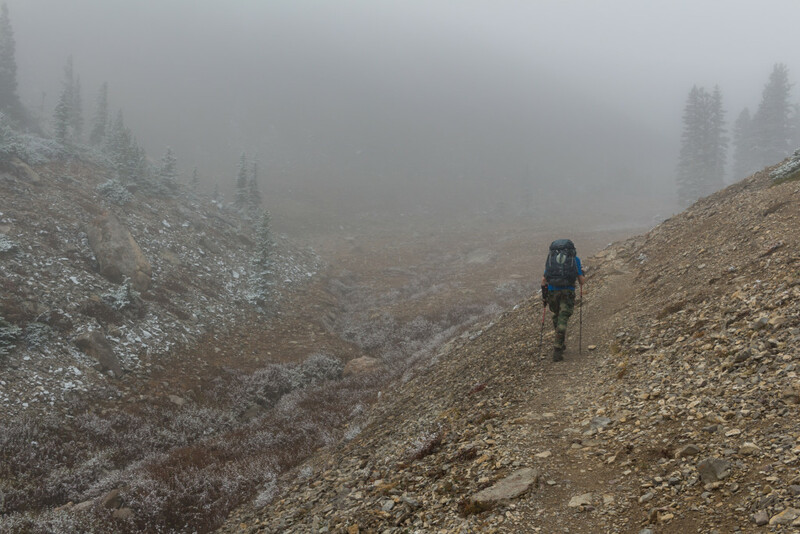 The fog was still incredibly thick when we began the ascent towards Sacajawea Pass. Even though I’d done this climb before I seemed to completely lose my sense of direction, relying only on the convoluted series of switchbacks to guide me. About halfway up the saddle a bit of hope leaked through the grey sky above. The sun, just faint orb of light in a sea of nothingness, had finally shown itself. The only question was, how long will it last? Invigorated by the sight of the sun, we hastily climbed the remaining distance up to the pass. The sun making its first appearance. Sacajawea Pass moments before the fog cleared. Sacajawea moments after the fog cleared. 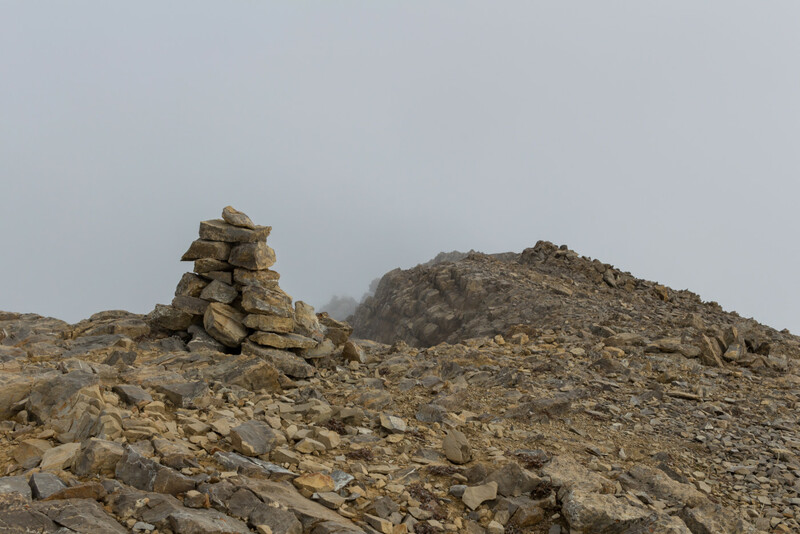 A very large cairn indicates the top of Sacjawea Pass where three trails intersect. To the south is the Bridger Foothills trail which can be taken to get to Sacajawea, to the west is the Corbly Gulch trail, and to the north is an unofficial trail which leads to Hardscrabble. 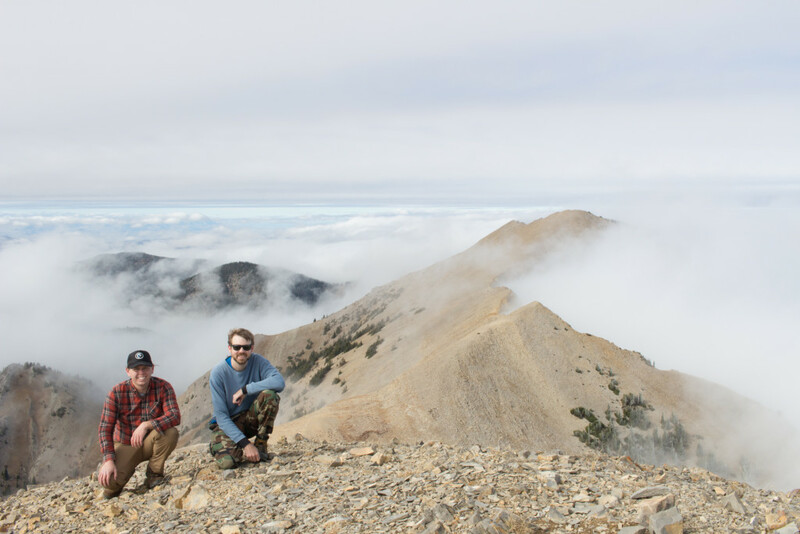 I highly recommend climbing the unnamed peak on the way to Hardscrabble. Some sites call this Pomp Peak which I shall adapt. Being in no hurry we decided to take a quick snack break while enjoying the views. Another pair of hikers were nearby photographing the scene, as was I. 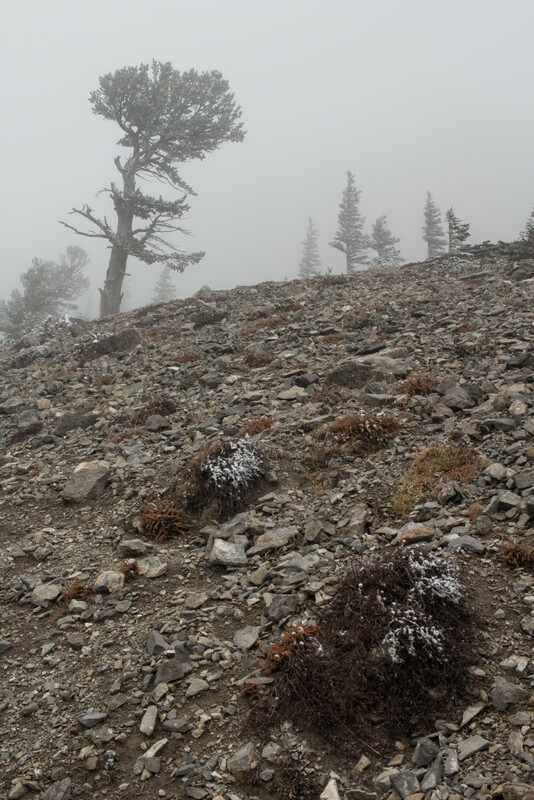 After a short time the wind picked up and we were once again surrounded by fog so we got ourselves bundled up and began the ascent up to Pomp Peak, just a short ways ahead. Several others were lucky enough to witness the scene. 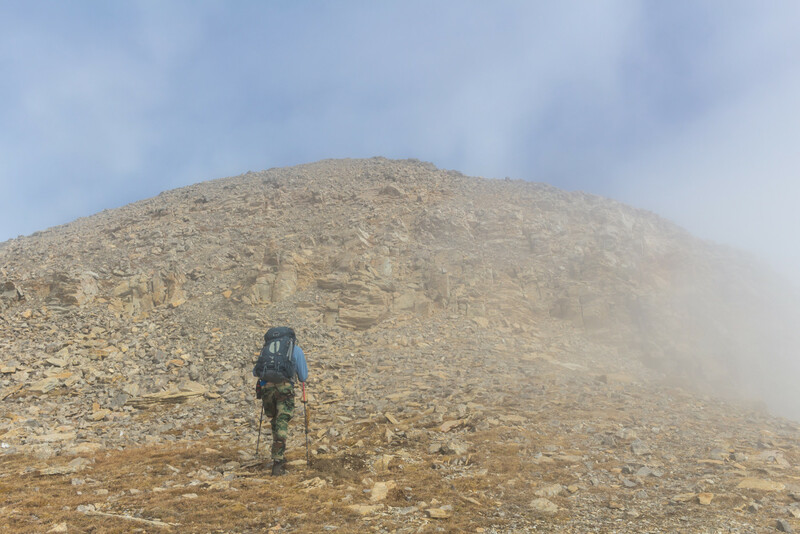 The final ascent up Pomp Peak. 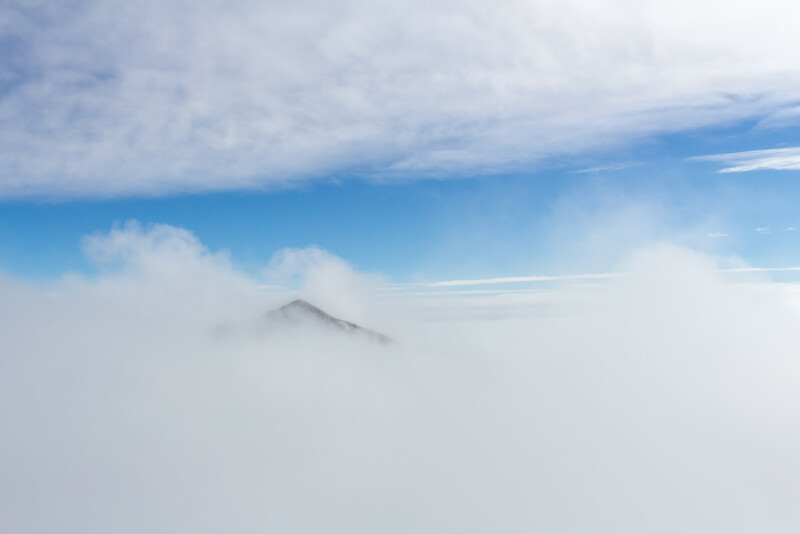 By the time we made it to the summit of Pomp the mist had cleared and we were once again above the clouds. Our timing could not have been better. 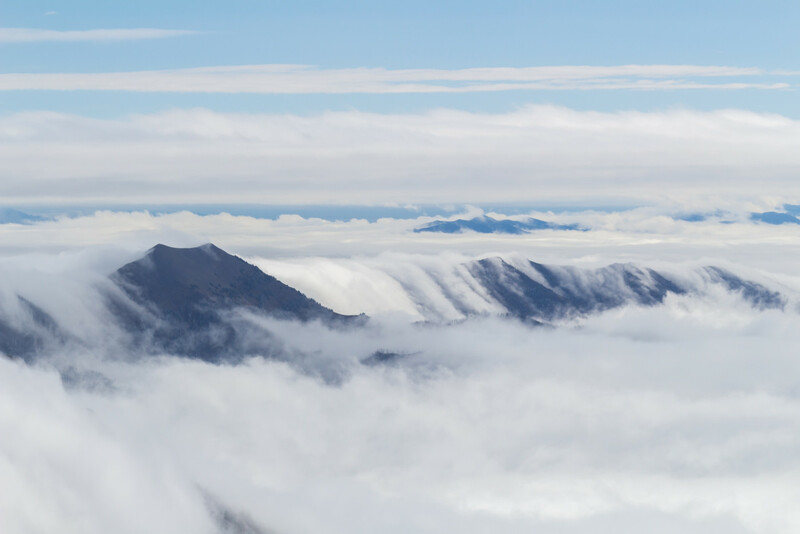 To the south the summit of Sacajawea slowly began to peak through the clouds which sent waves of excitement through my body. 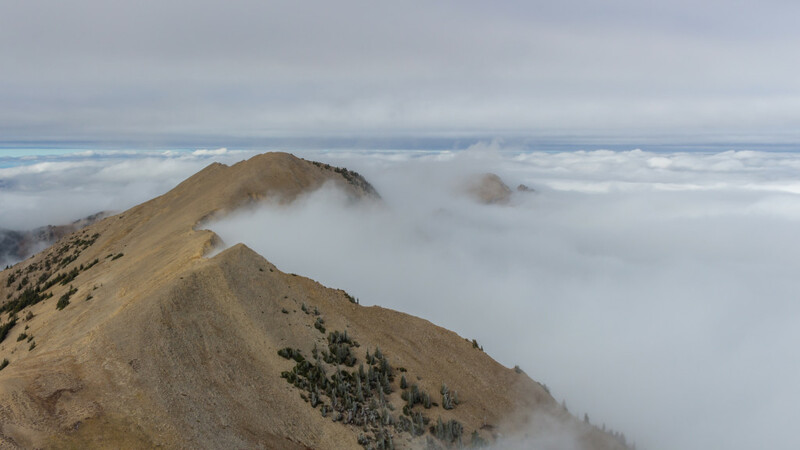 Slowly the sun baked away the top layer of clouds revealing more and more of the Bridger Range below us. Clouds could now be seen flowing like a river over the ridge, piling up on the east side and plunging over the west. View of Sacajawea from the summit of Pomp. In a relatively short amount of time (about 20 min.) 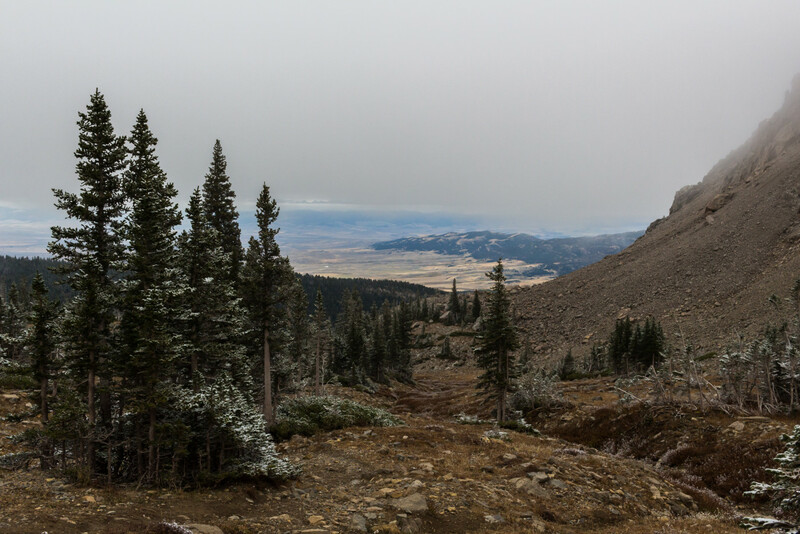 the clouds cleared and exposed the entire Bridger Range. On a clear day you’d be able to see the Crazies, Bangtails, Absarokas, Gallatins, Spanish Peaks, and Tobacco Roots. 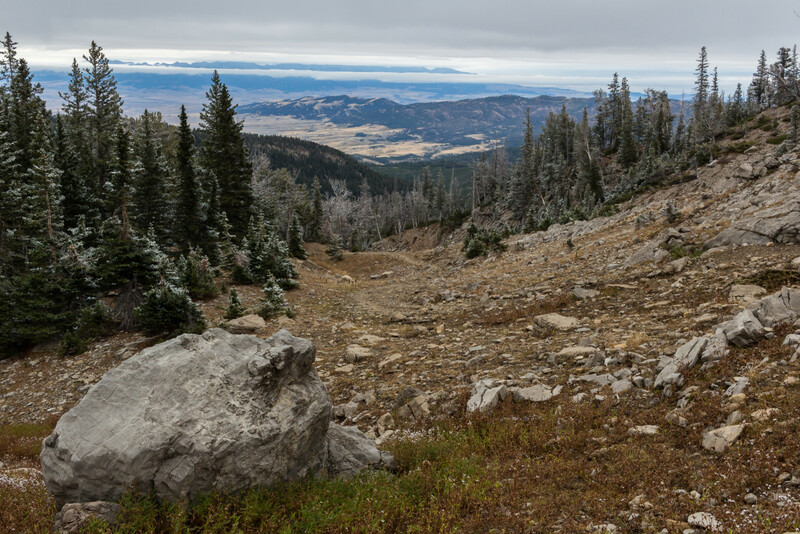 Pomp Peak, in my opinion, offers greater views than any of the other peaks along the Bridger Range. Looking west from the summit of Pomp. Arlo is heading east along the “arm”. In Montana, anything can happen. Looking north from the summit of Pomp. Hardscrabble is the furthest peak back. Bozeman is down there somewhere. After spending about 45 minutes taking in the sight we descended Pomp and made our way along the ridge towards Hardscrabble. This section of ridge gets a little sketchy. The west side is a gradual downslope but the east side is a near vertical drop. It’s thrilling walking along this section, just be sure to watch your step as a tumble down the side would definitely be fatal. Arlo peaking over the edge. Better not let his mom see this. After a short scramble we finally made it to the summit of Hardscrabble. There was no cairn there so I built a small one. Hopefully it endures the tests of time. The views are similar to Pomp and on a clear day you’d be able to see Frazier Lake in the cirque down below to the northeast. 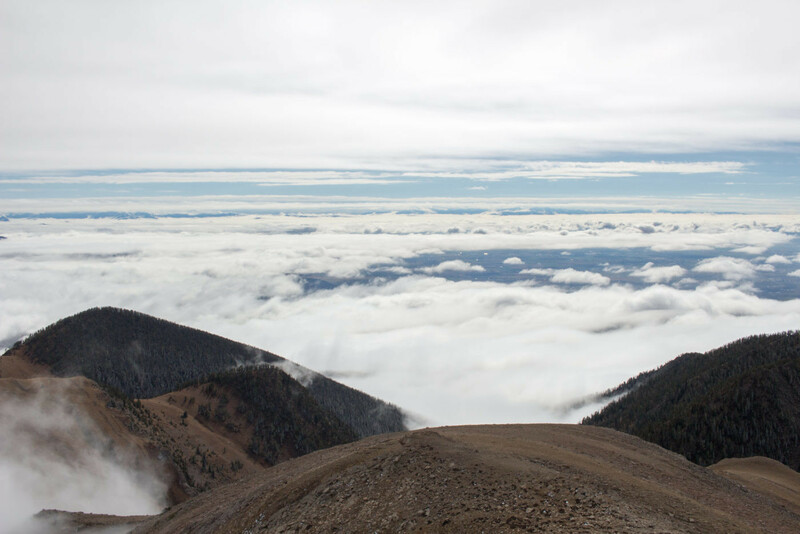 Clouds continued to blanket the valley, slowly dispersing, and we spent much time gazing into the mesmerizing scene. Looking north from the summit of Hardscrabble. Everything is immersed in clouds. Looking south from the summit of Hardscrabble. 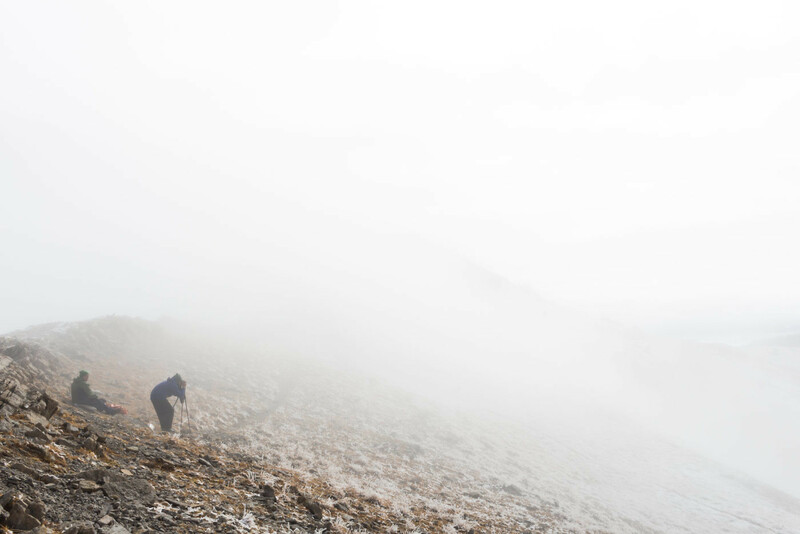 After having our fill we began a relaxing descent through the mist. 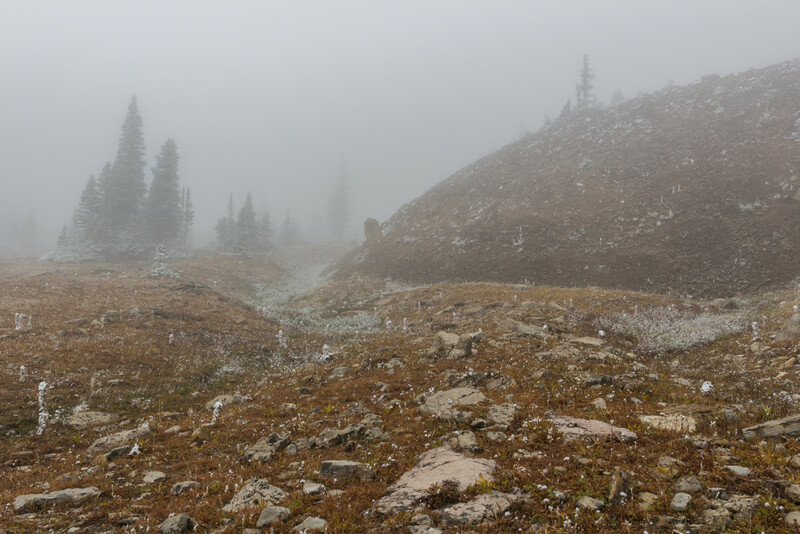 The clouds had formed very distinct layers by this point and the drainage below Sacajawea Pass was mostly clear revealing excellent views to the east. 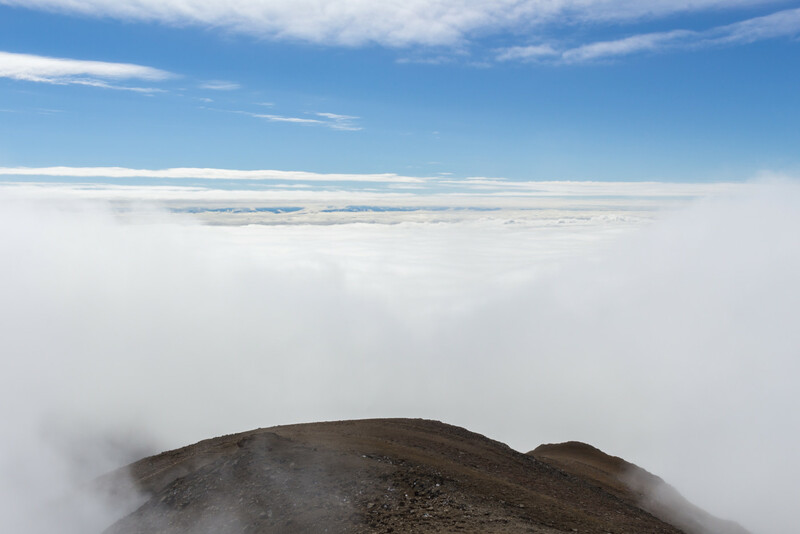 I’m grateful I brought my camera along to capture the indescribable beauty of this wondrous experience and encourage everyone to go seek out an opportunity to get above the clouds; it’s truly life-changing. Sacajawea on the way back down. An enormous amount of fog was still jammed up in the valley. I must admit the Bridgers looked unusually badass on this particular day. Looking west over Gallatin Valley. Looking down the Sacajawea drainage. Clearly much of the fog had lifted by now. One of my favorite pictures. Looking back up the drainage.